Tammy365: How to see in 3-D without Glasses! How to see in 3-D without Glasses! Do you like to travel? I do! I'm leaving for London and Paris on June 29th with a group of seven. Why do I like to travel? I love to see new things! 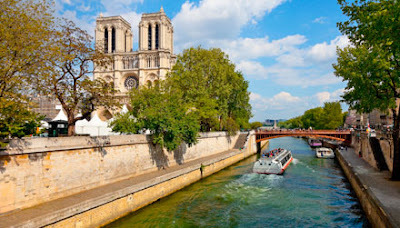 The picture above of Notre Dame is beautiful but it will be more majestic to see with my own eyes. The FBCC choir sang Daystar Shine Down on Me this past Sunday. Please click the link and listen to it before reading further. When I hear the phrase "Show me what I've never seen before", it makes me ponder this question. Does my eagerness to see God's wondrous works match my eagerness to see the Eiffel Tower? Do I desire to see works of God I've never seen before or do I have my sights set on seeing foreign countries? Psalm 40:5 says "Many, O Lord my God, are thy wonderful works which thou hast done, and thy thoughts which are to us-ward: they cannot be reckoned up in order unto thee: if I would declare and speak of them, they are more than can be numbered." Now those are some things I want to see! And, when we see them, it'll be 3-D alright! The only way we'll see the unseen things of God is in "3-Deity", through the righteous depth perception of The Father, The Son and The Holy Spirit! I love comments! Leave me a comment and let me know how this post spoke to you. Thanks Janice! Glad you stopped by, come back anytime! Hey Tammy! We are so glad you found us! One Sharendipity Place opens every Friday night and now that we have your email we'll shoot you a reminder on Friday nights, in hopes you'll come link-up with us each week! Very clever and interesting analogies here! looking forward to hearing more! Hello Sue! I am happy to be linking to One Sharendipity Place! I'll surely try to visit each week. Glad you liked my writing! It's encouraging to see a blog with inspirational bones.